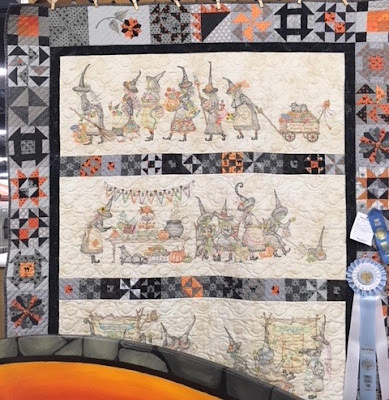 As I said in my last post, I entered my Dear Jane's Journey quilt in the Yamhill County Fair and won a 3rd place ribbon. I was very happy at how it was displayed. This is what you saw upon entering the crafts building! 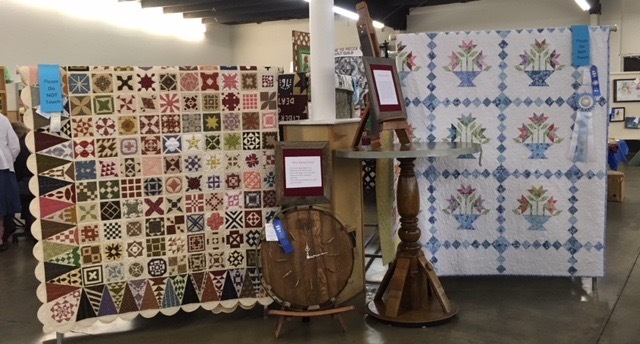 The quilt on the right won the 1st place ribbon and Best of Show. It is a beautiful quilt and the quilter who made it also made 2 other quilts that I will show. 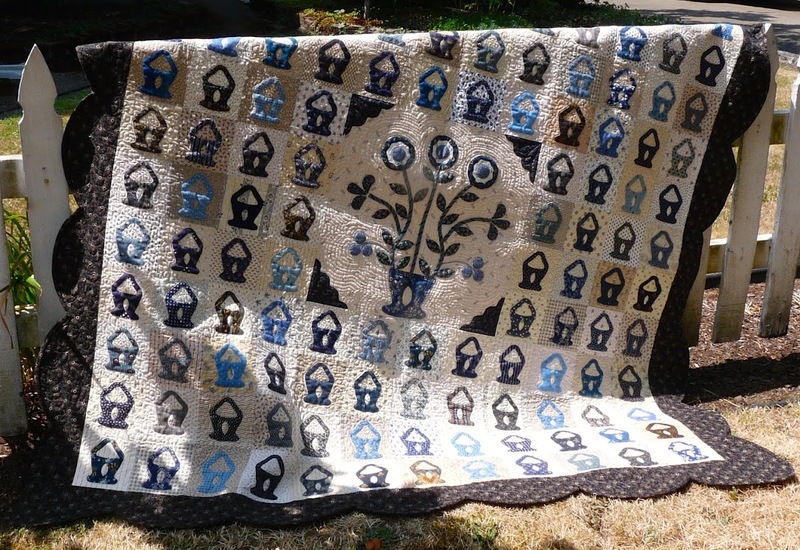 Here are the 2 other quilts and these were designed by Crabapple Hill. 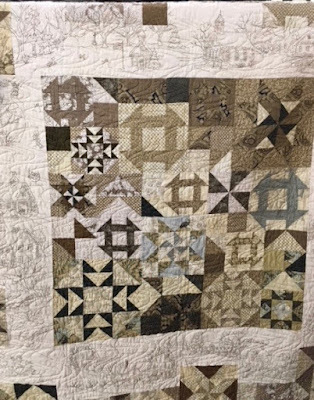 I'm sorry, but I didn't take a picture of the quilter's name. 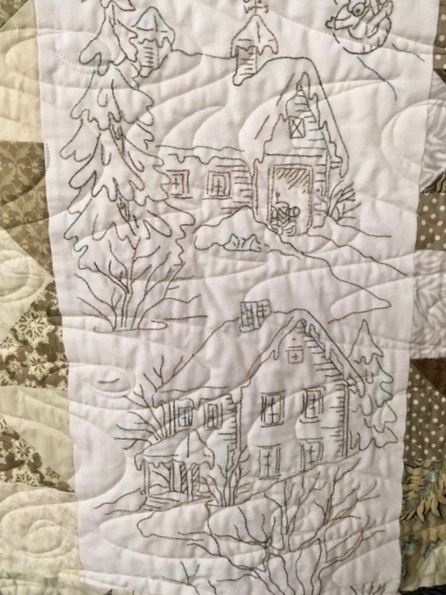 I recently joined another quilt guild because it meets during the summer, Gone to Pieces. 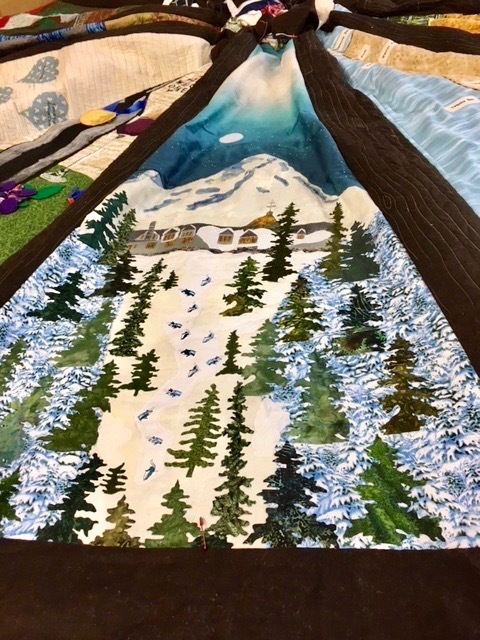 They are making a 14' tree skirt that will be sent to Washington DC to go under a 20' tree at the Department of Agriculture for Christmas. Here are a few pictures of the tree skirt. It is designed to look like a wagon wheel with each section of the wheel depicting an aspect of the State of Oregon. All the Christmas trees for the DC government buildings will be from the Willamette Valley forests, which is where I live (not in the middle of a forest, but in the valley). Making a 14' tree skirt is a huge undertaking and there is still a lot of sewing to do by hand which we all will participate in at our next meeting. 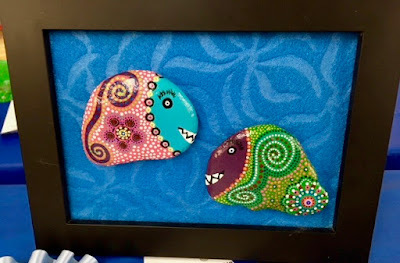 Stay cool and happy quilting! I wished your dear Jane won first place as it is beautiful. Thanks for all the cute eye candy this morning. 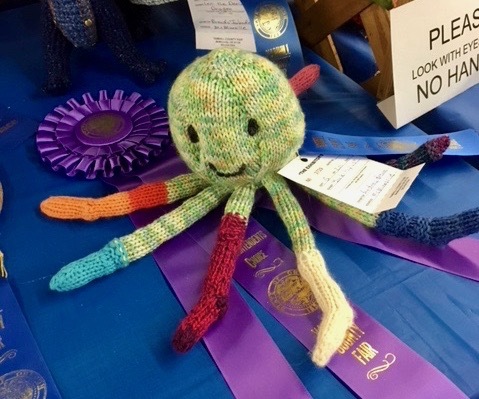 That knitted octopus was so cute. Congratulations on your award. I really need to finish my Dear Jane, have not worked on it in years. I have all but the kite border done. Thanks for sharing the tree skirt, its beautiful and such an interesting piece. 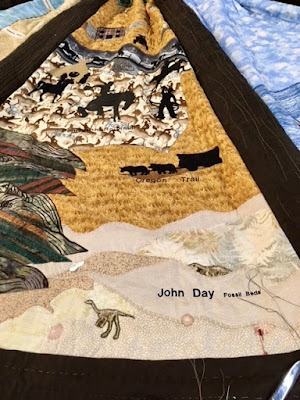 Your quilt is beautifully displayed! That tree skirt is quite an undertaking! Lots of pretty quilts there, and the Best of Show is quite lovely, but in no way does it compare to your DJ, in my opinion. I'm so proud of you! I love that you are just jumping in with both feet up there, and meeting new people and doing what you love! I wish I could get my feet to work! ---"Love"
I love county fairs. 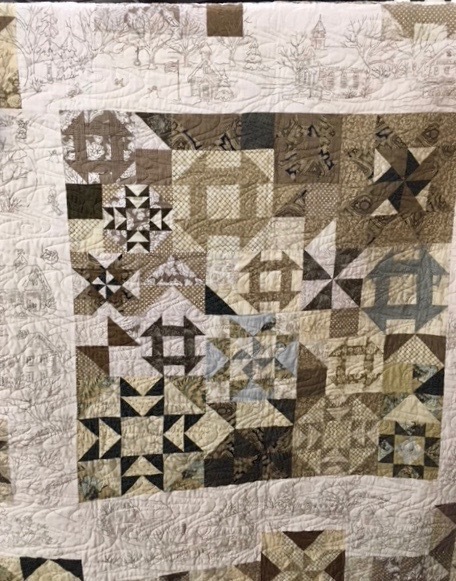 It must have been a hard decision to place your gorgeous quilt third, but I do like all of the quilts and thank you for sharing them. Also love the Christmas tree skirt. I hope you'll be able to get a picture of it under the tree in Washington. congratulations on your ribbon! and thanks for sharing the other pieces at the fair. Your quilt looks great hung up there! It is a real treasure Ruth. 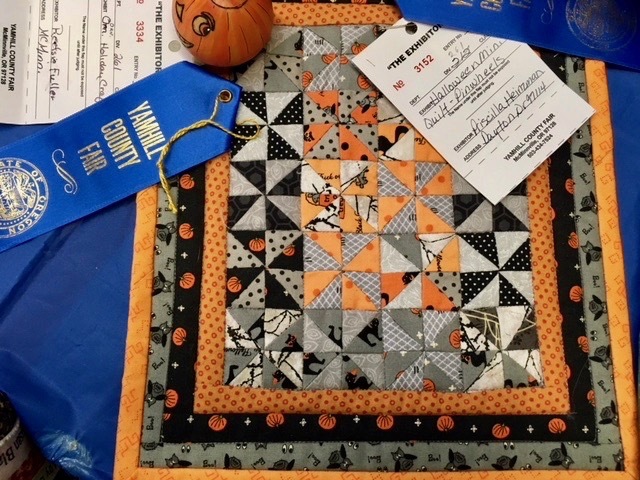 The other quilts and items are all great, too. 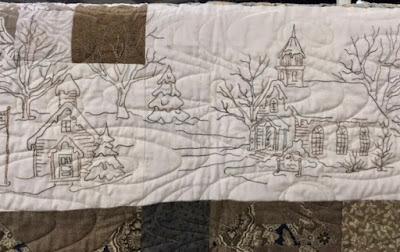 The tree skirt is amazing, what fun to participate in making a quilted tree skirt that will be on display under the Christmas tree. Have fun! Your quilt looks worthy of that blue ribbon to me, but the other is also quite nice... 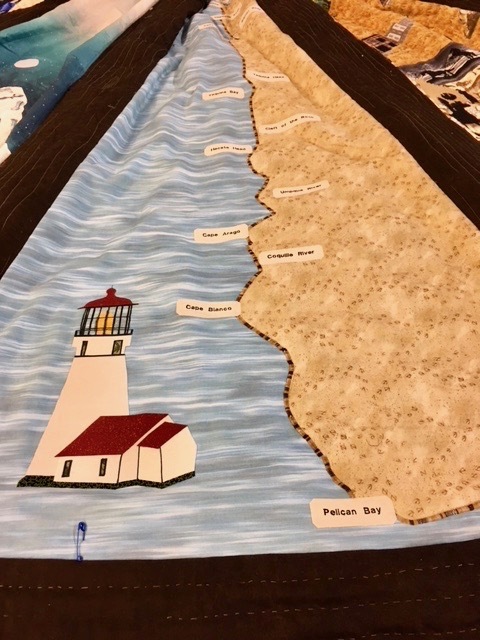 The tree skirt sounds and looks like quite an undertaking, but a fun one. Then again, from here those skiers look like ants... I hope those receiving the skirts will understand and appreciate their value!